These seem to be many machinists first project. Most are seem to be made from raw stock on a lathe but since I’m without that tool I cheated. I bought a few stainless steel hex bolts, nuts and long thread couplers and cut them to length with a Dremel & grinding wheel. 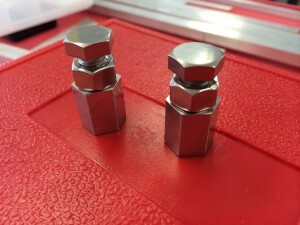 I then milled the tops and bottoms of the newly cut couplers and the tops of the bolts flat with a face mill and polished the surfaces to a shine. Nice little tools for an hour worth of work!